Anthony Scaramucci, the short-lived White House communications director, is making the rounds on TV next week. Scaramucci will be interviewed by George Stephanopoulos on ABC's "This Week" on Sunday. Then he'll appear on "The Late Show with Stephen Colbert" on CBS on Monday. Colbert made the announcement on Twitter on Wednesday evening. He added: "This is just a heads up for our censors to get ready!" They will be Scaramucci's first televised sit-down interviews since he was ousted from President Trump's staff after 10 short but memorable days on the job. Colbert's "censors" comment was a reference to an explosive New Yorker report that was published before Scaramucci left his role at the White House. In an interview with reporter Ryan Lizza published on July 27, Scaramucci used a string of curse words and leveled insults at his colleagues. He also accused then-chief of staff Reince Priebus of leaking information to the press. Priebus was replaced by former Homeland Security Secretary John Kelly on July 31. Scaramucci was removed the same day Kelly was sworn in. Dozens of television interviewers have been vying to interview the man known as "Mooch." Scaramucci briefly spoke with several reporters in the wake of his White House dismissal, but then pledged to go "dark" for a little while, so "This Week" and the "Late Show" will mark his re-emergence in the public eye. Colbert is one of President Trump's fiercest critics on television. And Scaramucci, a former Wall Street financier, has grabbed headlines for his ardent support of Trump. 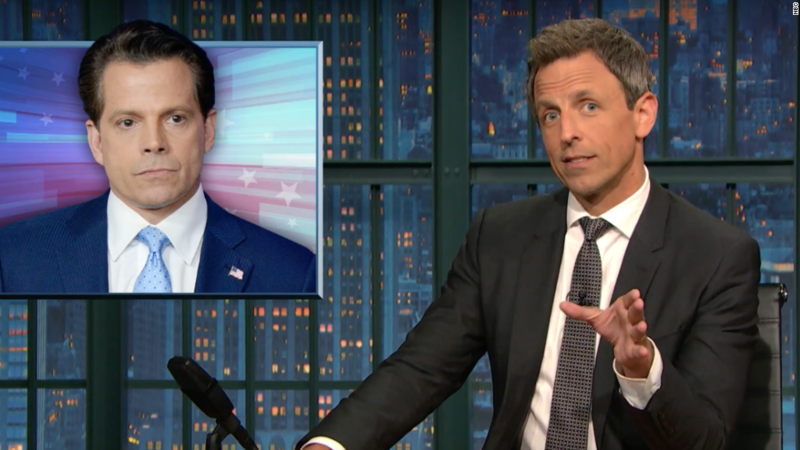 Colbert also lampooned Scaramucci's brief White House stint. "The Mooch lasted as communications director for only ten days! Ten! That's not even a whole pay period!" Colbert joked after his ouster. The other guest on next Monday's "Late Show" is the actor Bob Odenkirk.